Watch the Oberle’s journey in the 2018 CCF Video. Comfort from his sisters was essential during those long hours in the hospital. For the next few years, Andrew grew up happily in his home, competing for attention with his older sisters Julia and Laura. In July 2014, Caroline took Andrew to his doctor for persistent swollen lymph nodes. His pediatrician Dr. Starr ran multiple tests, which proved to be concerning. He recommended Andrew go to Sinai Hospital. Andrew and his mother met Dr. Joseph Wiley, who confirmed the troubling test results. 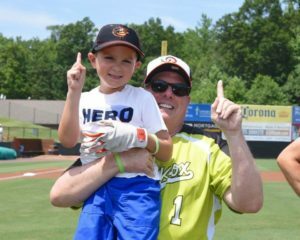 Andrew was diagnosed with Acute Lymphocytic (or Lymphoblastic) Leukemia (ALL), which accounts for about one in every three cancers in children. Andrew’s cancer, they learned, was rarer and slightly more aggressive than most ALL. Dr. Wiley suggested Andrew begin treatment immediately. 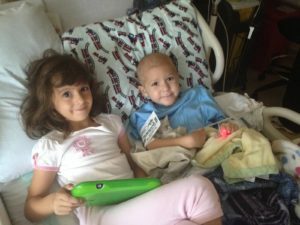 Fortunately, Andrew was diagnosed early, before his immune system was compromised, so chemotherapy treatments began the day after his diagnosis and just a week after the visit to the pediatrician. After three and a half difficult years of chemotherapy, Andrew completed his cancer treatments at the end of 2017 and was joined by family on February 19, 2018, to ring the bell at Sinai Hospital, signaling the conclusion of his treatments. Andrew lives in Silver Spring, Maryland with his parents and sisters. Once Andrew’s immune system strengthened, the Oberles could finally have the pets that the kids had begged for. Rounding out the family now is now a pug named Gracie and a cat named Skye. 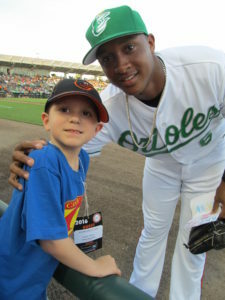 While an O’s fan, Andrew was especially fond of (now former) O’s player Johnathan Schoop. Andrew loves baseball, the O’s, and especially his friend Johnathan Schoop. 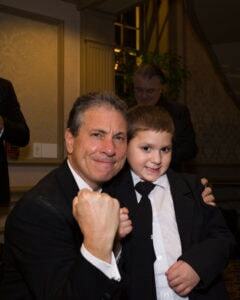 Andrew has made other well-known friends through his cancer journey, including Maryland Governor Larry Hogan. Andrew is active and loves all 8-year-old stuff, like Pokemon, swimming, geocaching, basketball and Monopoly. Caroline believes Andrew’s experience has given him compassion and appreciation beyond his years – he makes sure everyone is included in games, and showers attention on babies. Andrew has decided to be a “baby doctor” when he grows up. Although Dr. Wiley has since retired, Andrew is still treated at Sinai Hospital. Thanks to innovative and prompt treatments, today, Andrew remains cancer free.